Hi. Welcome to my blog. Thank you for stopping by! Wonder who I am? One fateful encounter, which I explain below, shaped my outlook about life and my personal belief that when I die I do not want to look back on my life with any regrets. Yes thats a hard one to live up to, but i am consciously and earnestly trying my hardest! My favorite Broadway quote comes from the fantabulous musical “Wicked,” —> “Those who don’t try, never look foolish.” Think about that one for awhile… To me it seemed like an invitation to move out of my comfort zone and do things i never imagined, even if it meant feeling a bit self conscious, like when I am at swim practice with my team and I *always* finish drills last! See what I mean? So why this blog? Why now at this time of my life? My experiences, triumphs, troubles, tribulations may be similar to yours or completely different. Let’s see! Let’s inspire each other and encourage each other as we share our lives together! It is said we are the sum of our experiences. Good and bad. Yes, I agree. But there’s another saying: “At any given moment, we are precisely where we want to be.” Wait, what? Well, not exactly. At least not for me. After raising two daughters and being married 28 years, I found myself in an unwanted and painful upheaval of a divorce. Not my choice. It’s been a real struggle on so many levels…. My life philosophy was cemented into my being after one enlightening experience. I once ran into a friend I had not seen in literally five years. (!!! After five years! !!) We hugged. I asked her, “What’s new?” Her response was, “Oh nothing.” I was so shocked at that answer I vowed to never, ever live a life so absolutely routine it would ever require an answer like my friend gave me that day so long ago. I taught my philosophy to my children as well: life is no dress rehearsal. We only go around once. We receive no second chances! Live life joyfully. Be grateful for everything. Expect nothing. Celebrate family and friends always. <——— Try it. You will like it! 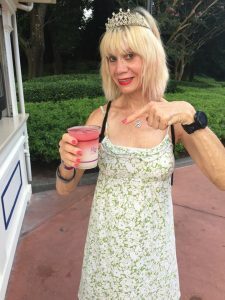 Disney Flower & Garden Festival fun! I have blogged before. Way before social media was even a “thing.” A lifetime ago it seems. We had one of those huge RVs rolling down the road, towing a Jeep. We traveled all 49 contiguous US states, and lots of Canada, too. I wrote copiously about our journeys and experiences to a fairly large following of family and friends, all sent via email. No attachments back then! Those peeps relied only on my words to describe our wonderful experiences! Thus began my blogging career, which I plan to resurrect here. I am vegan. There I said it. That disclosure usually puts people on the defensive. Why? I have no idea. I’m vegan for a variety of reasons: to improve my diet (so I live a longer & healthier life) and to improve my athletic performances. Another reason is my displeasure of huge factory farms and the suffering of animals. I have a “meat free” home, and people’s reactions who visit me amuse me. Imagine my surprise when I found our McDonalds in Paris served vegan burgers! I did not really become serious about fitness until after my two children were born. It was tough to lose that baby fat. I ran for pleasure first, then amped it up to compete in races. During my divorce, I ran to get away from the pain. I ran to clear my head. I talked to God. I found I liked running a lot. I started winning my AG (age group) at races. I ran longer and longer distances: half and full marathons. On 01/01/2016, during a New Year’s Eve house party, I was involved in an accident and my left ankle broke. 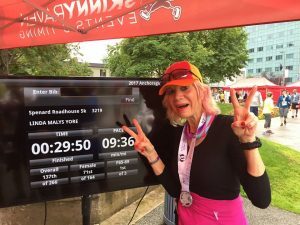 My life changed in an instant and never was the same….. sadly, I don’t think any half or full marathons are in my future. But happily, I was introduced to the world of triathlons (to cross train while the ankle healed) and those are some bada$$ athletes who taught me a lot! Winning silver at the Florida Senior Games was so sweet! After years of caring for my family, house, chores etc, I now have the time to devote to another one of my lifelong passions: travel. The world really IS a smaller place these days and experiencing cultures in far away places is not only enlightening, but has made me a wiser, more respectful person. Remember my fave Wicked quote, “Those who don’t try, never look foolish?” What does that mean to YOU?! Please leave your answers, comments and questions in the comment section below. Welcome back to the world of blogging, Linda. Can’t wait to hear more of what you have to say! Thanks Sarah. I am very excited to be starting this blogging journey. Glad you will be accompanying me! Thank you Sarah. I am very excited. Love this. Can’t wait for more blog posts! Thank you Melanie! I am excited. You are beautiful Linda my fav vegan over 65 happiest woman ever always positive gotta love u this blog is radical and so you!! Oh Kyrie! Love you girl! Thanks for the kind words. Please come along for the ride! There are so many things to try that I’ve consciously or subconsciously winnowed the field. I’ve never jumped out of an airplane and imagine that I never will, but I don’t feel as though my life is deficient because I have chosen to forego that experience. OTOH, I learned from my husband that part of becoming an expert is to declare oneself an expert. I found that kind of ridiculous until I tried it and became an expert, speaking at national conferences in my legal field. Let me know when you have a few travel blog posts live and we’ll welcome you to the Boomer Travel Blogger Facebook group. Meanwhile, Write On! No jumping out of airplanes for me either. I love your husband’s advice about believing you are an “expert” thereby becoming an expert! Great positive attitude. Do what it takes to become an expert!Yes, the divorce catapulted me into a deep abyss on so many levels. But I am slowly working my way back into the sunshine. And finally, I’ve got several travel blogs brewing in my mind, so it won’t be long! Outstanding, Linda! Here’s to many more chances to look foolish! I’d love to read about your experience at the Senior Olympics and winning (earning, fighting for…) that silver!! I hope you’ll blog about it soon. Thank you Colleen. 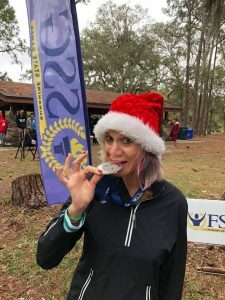 I’ve got some running ideas to blog about, and the Florida Senior Games would be an excellent subject to explore as well. And I swam in the qualifying heats and earned the right to swim at the state level as well. It was very exciting! Hi there to every single one, it’s genuinely a good for me to pay a visit this site, it includes helpful Information. Thank you. I am very happy you find it helpful.